The Amateur Traveler talks to Lee from Atlanta about side trips that you can take when you travel to Shanghai this year for Expo 2010. Lee is currently living in China and talks about 3 different weekend trips to destinations that are located near Shanghai. Lee starts us the in history-rich city of Nanjing the site of “China’s Holocaust” in WW 2. Nanjing has been the capital for 6 different Chinese governments and still retains its ancient walls in addition to modern shopping and the tomb of Sun Yat-sen. It was also the location of the world’s worst civil war, the Taiping Rebellion. 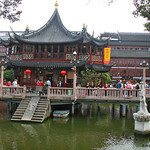 After Nanjing we explore the many gardens and the canals of Suzhou. Finally Lee takes us to Hangzhou with its beautiful West Lake which the Chinese compare to heaven. Paying to use the plane potty? Taiping Rebellion – largest civil war in history started by Hong Xiuquan who declared himself the brother of Jesus. Does Amateur Traveler work for you at work? Access site just great from work. I can get to Amateur Traveler website from work, http://www.ftpsllc.com I know in the past some of our corporate filters would not allow websites with the word ‘podcast’ in them. Weird, I have not seen filters for podcast before. Huh. Another great show. Unfortunately, I am one of the ones that can’t access the site from work (a city fire department). For me, it’s not the end of the world. I have episodes on my iPod and if I want to take a look at the site I just wait till I get home. Do you know what about it is blocked? Is because it has “amateur” or “podcast” or something else? Able to load at work. Loaded fine for me. I’m surprised it wasn’t blocked actually. (This may change next week.) Not because of any keywords, but our firewall keeps out blogs in general. The site works just fine for me. I have “Websense” as a filter program. Around 15:27 you showed a picture of a train speedometer going up to 431 km/h. While the train from Shanghai to Suzhou is quite fast, it isn’t *quite* that fast – that honour belongs to the Maglev which takes you from the airport to the outskirts of Shanghai! It’s quite surreal: on one shore of the lake is the modern city, and around the rest of it is the ancient buildings. – I took a bus to Lingyin Si, the Temple of Inspired Seclusion, big, with elaborately decorated statues, and a huge pavilion housing imaginative statues of the arhats. – When I was there the Master of Nets was open in the evening, with performances of Chinese music and dance. Rather touristy, but the garden was magical at night. – I particularly enjoyed visiting the Museum of Embroidery – not really a museum, but a workroom with women doing silk embroidery that looked like paintings. The Silk Factory can be skipped if you’ve seen silk production elsewhere. – I found the bus system in Suzhou particularly easy to use, as the stops on the main street had maps.